Every so often I get tired of baking muffins for breakfast, and want to change it up a little. This week I thought it would be fun to make a yeasted breakfast bread, something like the apple crunch bread at Great Harvest. 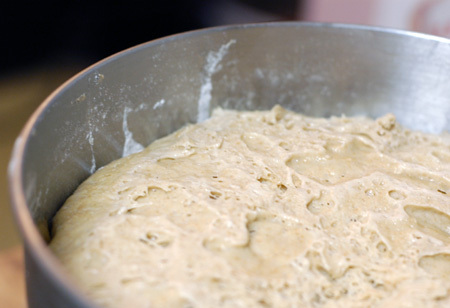 It had to be a tender, enriched dough, but I also wanted some whole grain, so I ended up using the whole wheat brioche dough from Healthy Bread in Five Minutes a Day, which includes a mix of all-purpose and whole wheat flours. I did cut the recipe in half, as I didn’t think we needed to eat four pounds of brioche, and the inclusion of eggs means that this dough doesn’t store as gamely in the refrigerator as most of their other bread recipes. By halving the recipe, I ended up using three eggs rather than the original five, so my dough was quite sticky. I added an extra half-cup of flour, which made it just barely workable, and called it good. After two hours of proofing in the oven, I transferred the dough to the refrigerator to chill, which made it a bit more cooperative. Then I rolled out half of it into a big rectangle, filled it with finely chopped and lightly sweetened apples and walnuts, and rolled it up into a loaf. I crowned the loaf with a basic streusel mixture and allowed it to proof until it had risen over the edge of the pan, about an hour, then baked it up in a 375F oven until it hit an internal temperature close to 200F, about 40 minutes. It came out pretty well. The bread was very lightly sweetened and had a tender, uniform crumb. 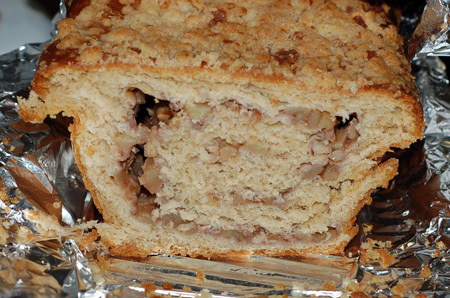 The apple mixture formed a lovely swirl and the inclusion of walnuts added some textural contrast. The streusel topping was great, and I’ll admit it, I was a little bummed that it wasn’t able to cover a greater percentage of the crust; I may have to try a freeform loaf next time to remedy that. A few days later, I used the remaining brioche dough to make a loaf of cinnamon swirl bread, simply filled with cinnamon sugar. It was delicious, and we almost ate it up before I had a chance to get a photograph. 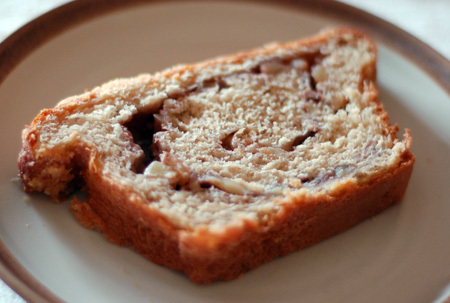 Next on the list, a chocolate swirl loaf! Your apple bread sounds really good! 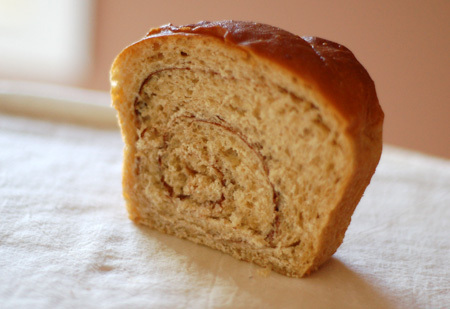 And the swirl on the cinnamon loaf is perfect!